At this event, children will have the opportunity to learn about construction, agriculture, and forestry with a day full of exciting activities. 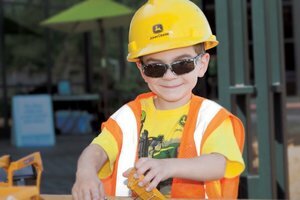 John Deere has announced that the John Deere Pavilion in Illinois will be hosting its annual Learn and Play Day on Saturday, July 21 from 9 a.m. to 4 p.m. This event is specifically designed to welcome kids of all ages who want to spend the day learning about the work of John Deere customers. It is free to attend, and children will gain insight into life on a farm, what it’s like to work on a construction site, and the forestry industry. Kids who attend will be able to test their driving skills in a battery-powered Gator on an obstacle course. There will also be a pedal-powered tractor pull, a petting zoo, and a construction zone. At the construction zone, children will be able to test toy equipment in the sand. In addition, there will be an innovation station where kids can build equipment and buildings out of Mega Blocks. More information about the John Deere Pavilion at 1400 River Drive in Moline can be found by visiting www.VisitJohnDeere.com.